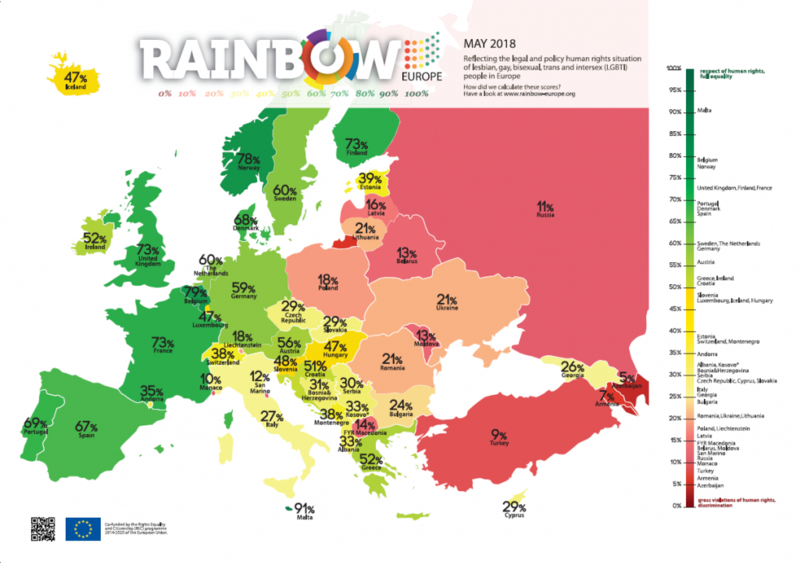 ILGA Europe, an organisation that deals with the protection of interests of lesbians, gay, bisexual, trans and intersex people, annualy publishes the Rainbow Europe report marking the International Day of Combating Homophobia and Transphobia. The report contains information on the position of LGBTI persons, the level of protection of their human rights in each of the states, particularly those regarding discrimination, right to family life, hate crimes, recognition of gender identity, freedom of assembly, association and expression, as well as right to asylum. This year, the report resumed data collected in forty-nine (49) countries, and the general conclusion is that even the countries, which were leading in the development of policies for promotion of LGBTI human rights, show a worrying trend of decline and stagnation in advocacy and development of legal frames and policies for improvement of legal status of LGBTI people. Current political climate is particularly worrying, as it often leaves traces on those most vulnerable groups of society, including LGBTI people. Bosnia and Herzegovina is no exception. Everyday advocacy of non-governmental organisations for equality of LGBTI people faces constant obstacles, most commonly regarding the freedom of assembly, despite the Law on Prohibition of Discrimination which prohibits discrimination on any ground, including ones on the basis of sexual orientation and gender identity. Thus, the problem is not a lack of adequate legal regulation, but the implementation itself and the readiness of executive bodies to implement them. For this reason, in this report, Bosnia and Herzegovina received a rating of 31%, which means that no progress has been made compared to the previous year. Sarajevo Open Centre is constantly working on improvement of that image, organising various educations and workshops for police, attorneys, judges and others, in order to raise awareness of the importance of this issue, because those most important state structures are the key in its recognition, and only then we can start to build an equality-based society. The chapter for Bosnia and Herzegovina will be available in the following period and you can find it here.